Aveyard was named one of four scholarship winners across Minor League Baseball. 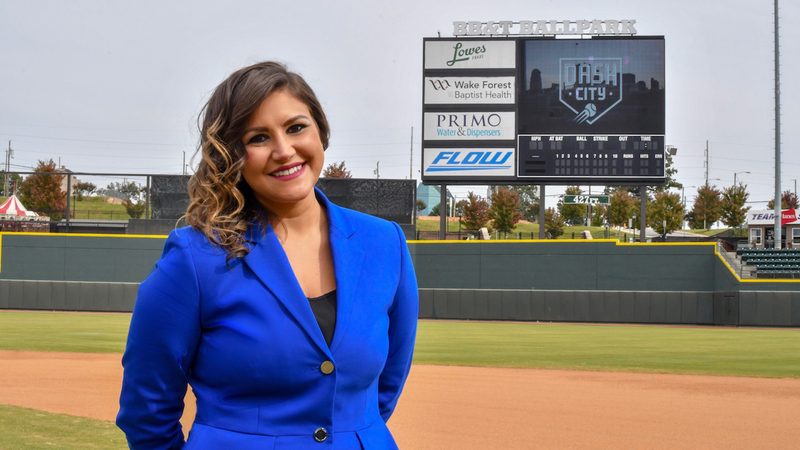 WINSTON-SALEM, N.C. (Nov. 1, 2018) - Minor League Baseball and the Women in Baseball Leadership Committee announced on Thursday that Jessica Aveyard, who has served as the Director of Entertainment for the Winston-Salem Dash since August of 2016, has been named one of four recipients of the Women in Baseball Leadership Event Scholarship. The award includes registration to the Baseball Winter Meetings, which will be held from December 9-13, in Las Vegas at the Mandalay Bay Resort and Casino. The Women in Baseball Leadership Event was established in 2008 at the Baseball Winter Meetings, providing a platform for female executives in Minor League Baseball and Major League Baseball the opportunity to network with their peers, obtain guidance on career development and enhance their professional skills. "Jessica's genuine excitement and passion is infectious and she plays a major role in our organization's success," said Dash President C.J. Johnson. "We are thrilled that Minor League Baseball has recognized her performance and provided her with this unique opportunity." With Jessica leading the entertainment crew on a game-to-game basis, the Dash have provided an exciting, family-friendly experience at BB&T Ballpark for the largest audience in the Carolina League. For each of the team's home games the past two years, Jessica was responsible for creating a game log of sponsored reads for the public address announcer, organizing skits for in-game breaks, managing the Dash Pack (the team's on-field entertainment staff), choreographing MiLB.tv's gameday production and managing marquees for BB&T Ballpark's outfield LED and in-stadium scoreboard. On top of that, Jessica spearheaded several public relations initiatives, including a partnership with the Vs. Cancer Foundation that helped raise thousands of dollars in donations for cancer research. Along with her daily duties, Jessica also served as the director for seven Dash home games broadcasted on NBC Sports Chicago, the Chicago White Sox cable rights holder. For these seven contests, Jessica was responsible for coordinating countdowns to commercial breaks with the NBC Sports crew, handling technical issues and directing shots, all while managing her regular duties as the Director of Entertainment. This year marked the first season in which the network carried Dash games. Prior to joining the Dash, Jessica played a key front office role for the Dayton Dragons (Low-A, Cincinnati), one of the most successful teams in Minor League Baseball. With the Dragons, Jessica was an Entertainment Assistant and a part of the on-field entertainment staff known as the "Green Team." Due to her efforts, Jessica was a part of a staff that helped the Dragons sell out Fifth Third Field each night of her nine-year tenure with the club.